Easter Holiday Singing Workshop in Southampton! BILLIE EILISH | ADELE | SHREK THE MUSICAL | HAMILTON and more! We will be offering bespoke Performing Arts tuition within a small number of schools in and around Bristol from January 2019. Get in touch to find out if you can have lessons at your school, and be sure to have a look at our Schools page. Weekly sessions in Bristol outside of school! Have a look at our Bristol page for location, days, times and fees. Bristol Autumn Term dates for the 2018-19 academic year! Come and try out one of our sessions for FREE! Email hello@weperformforlife.com or call 07910 51 55 52 to reserve your place now. 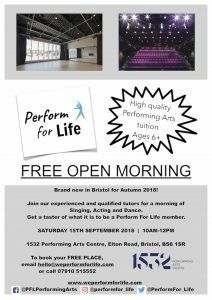 Come and join us for a FREE Open Morning full of fun and engaging Performing Arts activity! If you have a son / daughter aged 7+ who is interested in performing, then bring them along. They’ll meet Kat, our Founder and Director, and will get a taster of our sessions at Perform For Life. Call Kat on 07910 515552 or email hello@weperformforlife.com to reserve your FREE place! Pop over to our Facebook event page for more details. Have a look at our Our Belief & Approach page for more detail on our sessions. Follow us on Facebook, Twitter and Instagram to find out what else we’re up to.